Please accept my apologies for the sporadic blogging. I’ve already used the birth of two grandchildren and my son’s heart attack as excuses for not writing, although I did try from time to time. Everything I put to paper sounded too whiney and self-absorbed, so I used the time to write fiction instead, permitting murderers and adulterers and Pam Smith’s badly behaved children to take over my thoughts. Getting down to business, I have problems ending a story. A novelist builds tension throughout the body of a piece, and should try to end it with some pizzazz. All too often though, it falls flat. I’ll use Someone Like You as an example. In this story, two sisters raised in an atmosphere of violence, long to lead normal lives but end up exposing their own children to very similar environments. I felt they had somewhat resolved their issues toward the end, but what then? They were going to live happily ever after, sort of. I wanted to expand the story and show them having a happy time with mom and dad, everything forgiven but it felt like a fairy tale; not usually the way life is. So I left the reader dangling a little. The sisters were going to have supportive men in their lives, but the issues they struggled with would still be there. In The Savant of Chelsea, the ending came to me suddenly, like a gift. A reviewer who hated the book, said about me; “I could just sense how f*+king proud she was of herself.” Lol! I love that ending! And believe me, it came from some universal energy…I can’t take credit for it. Also, the end of Pam of Babylon; when she tells Andy Andretti, “Call me Pam,” I burst into tears. Family Dynamics and The Tao of Pam, those are powerful endings too, I think. But it’s not necessary to end every book with a bang. In The Goldfinch by Donna Tartt, I was left scratching my head at the ending. But it didn’t make any difference to the Pulitzer committee when they gave her the prize for literature! And Gone Girl by Gillian Flynn. Huh? What kind of ending was that? Yet the book remains on the NYT Best Sellers list because it is a compelling story that was difficult to put down. It had to end the way it ended. Sometimes I end the books the way I do because there is just nothing more to say about the story. In Alice’s Summertime Adventure, my editor asked that I add at least another paragraph, but I just couldn’t. For me, the story was over when the action that happened… happened. (Don’t want to give away any spoilers.) Other times, I end the way I end because I’ll start the next chapter in a new book. I’m doing that with A Greektown Wedding; the action picks up where Christmas in Greektown ended, with Liz, John’s wife and Jim, Maria’s husband leaving the apartment above the grocery store together. In the next book, they stop at a hotel on the way home from Greektown after the holiday meal. Anyway, enough about that. I wanted to address it because it keeps coming up and I’m sure will continue to do so. Here’s a great article from Huffington Post about endings. Last but not least….the grove. 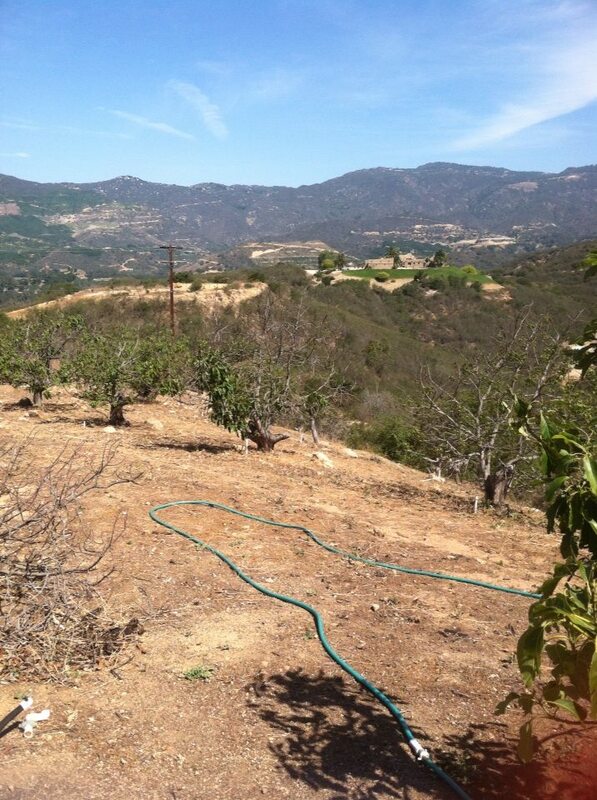 Jim and I bought a small piece of land in southern California and we didn’t realize it had a grove of dying fruit and nut trees; avocados, figs, citrus and macadamia. I think I must have an arborist gene; I know I’ve inherited a love of trees from my father. These trees are driving me crazy. I have spent part of every day for the past month pruning, watering, raking, and haven’t touched half the trees. Jim got into the act, bless him and he makes it much easier. A gift from him this week; another hundred feet of hose so I no longer have to carry five gallon buckets of water. We are in a water emergency here in the west, but I’m very careful about watering. My only fear is that I’ll kill something that is doing fine in dormancy, although my Aunt Lil just confirmed I should be watering. Here’s an Indian Prayer for trees. You lived first, and you are older than all need, older than all prayer. All things belong to you — the two-legged, the four-legged, the wings of the air, and all green things that live. You have set the powers of the four quarters of the earth to cross each other. You have made me cross the good road and road of difficulties, and where they cross, the place is holy. Day in, day out, forevermore, you are the life of things. This entry was posted in Books, Goal Setting, Gratitude, Prayer, Spiritual Life, Uncategorized, Writing and tagged Pam of Babylon, The Savant of Chelsea, trees, writing by Suzanne Jenkins. Bookmark the permalink.